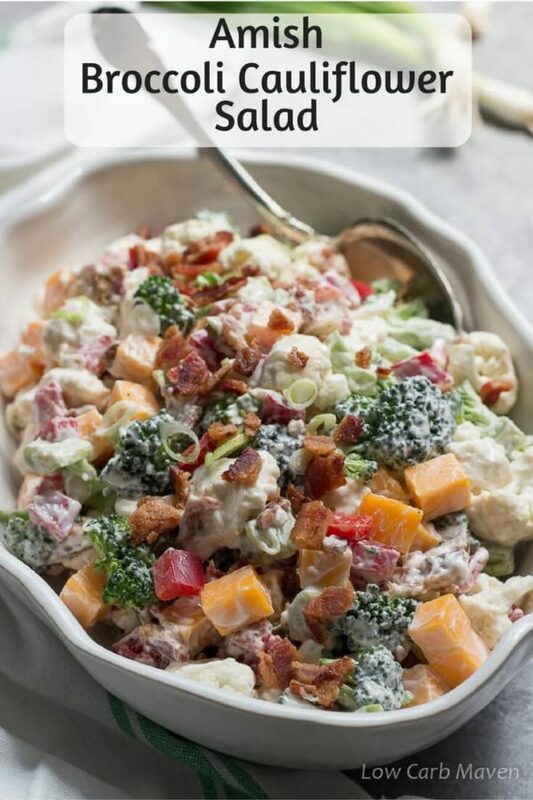 Amish Broccoli Cauliflower Salad tossed in a creamy dressing of yogurt and mayonnaise. 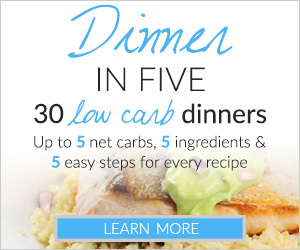 This easy recipe is perfect for gatherings and low carb friends. The first time I had a raw broccoli salad was at my bridal shower over 20 years ago. My mother’s recipe for broccoli salad had bacon and cranberries. Yum. It’s been my family’s go-to summer salad ever since. But it’s nice to change things up once in awhile. This Amish broccoli cauliflower salad does it for me. It’s especially a hit with the cheese lovers in the family! 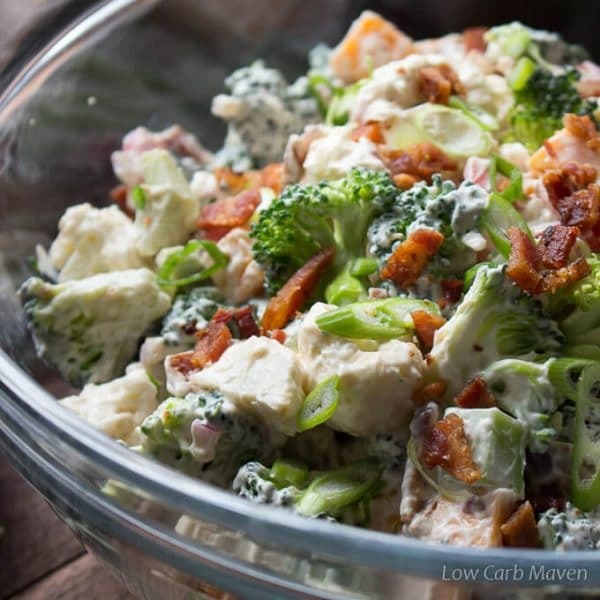 I have a recipe for low carb broccoli salad with bacon on the blog. I love it because it’s so easy to customize. I add nuts and seeds by whim and sometimes add a few raisins or unsweetened cranberries. A little sesame oil adds a pleasant sweet flavor. 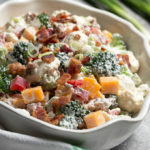 What I really like about this Amish broccoli cauliflower salad recipe is the cheese. 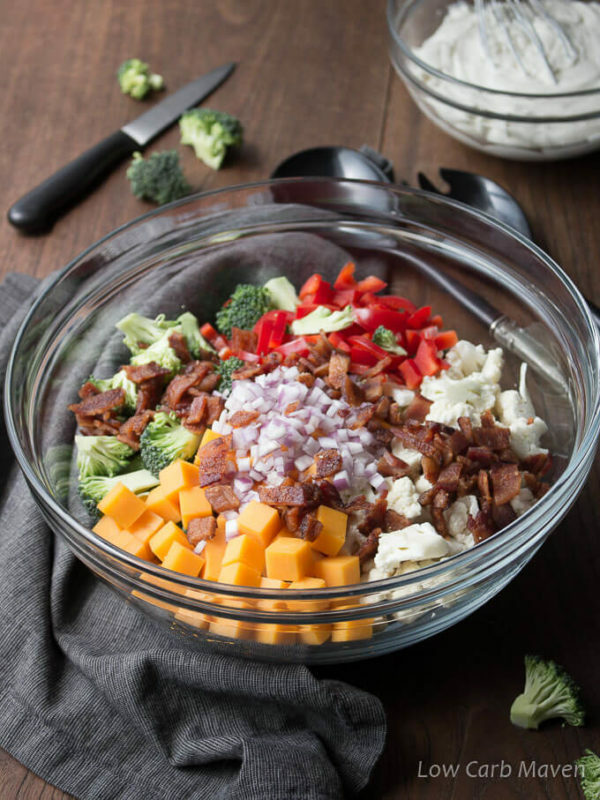 Using sharp cheddar cheese adds a nice tang and texture to the salad. Some recipes for Amish cauliflower salad call for grated cheddar cheese, but I like it cubed. I admit it’s purely based on aesthetics. The grated cheese mixes well, but the salad becomes a creamy indiscernible mess. Cubing the cheese adds another visible layer of texture. This recipe, too, is easy to customize. Try replacing the cheddar cheese with Parmesan or any other favorite. Add seeds or nuts – sunflower seeds would be great. Try using a colored variety of cauliflower for fun. And who doesn’t like a cool creamy dressing? 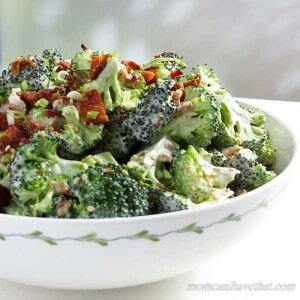 Many recipes for Amish broccoli salad call for a combination of mayonnaise and sour cream. I opted to use mayonnaise and Greek yogurt. Use either – they’re both great. 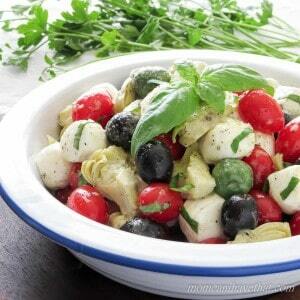 The salad keeps well in the fridge and is a great for family gatherings or a pot-luck. 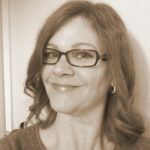 I make sure to bring low carb sides or sugar-free desserts to any gatherings so that I have a few on-plan options. Amish Broccoli Cauliflower Salad is 3 net carbs per cup. Meanwhile, wash and chop the vegetables and place into a large bowl. If serving the salad the next day, cover and refrigerate. Mix the ingredients for the dressing in a medium bowl and taste to adjust the seasoning. Cover and refrigerate if not using right away. Toss the salad ingredients with the broccoli then stir in the dressing. (I use less dressing than the recipe makes - as shown in the photos, but you may want to use it all.) Serve. Refrigerate any leftovers up to 5 days. Makes 7 cups at 1 cup per serving. 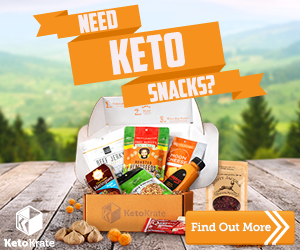 *Use regular sugar if not following a low carb or sugar free diet. Yet again another winner! 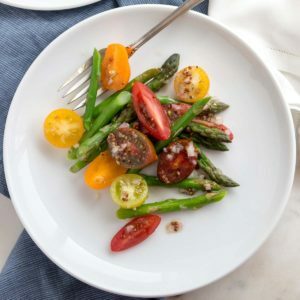 I was looking for a recipe that is similar to a broccoli salad dish I used to get for lunch at a pizza place near where I used to work. This one fits the bill and then some. 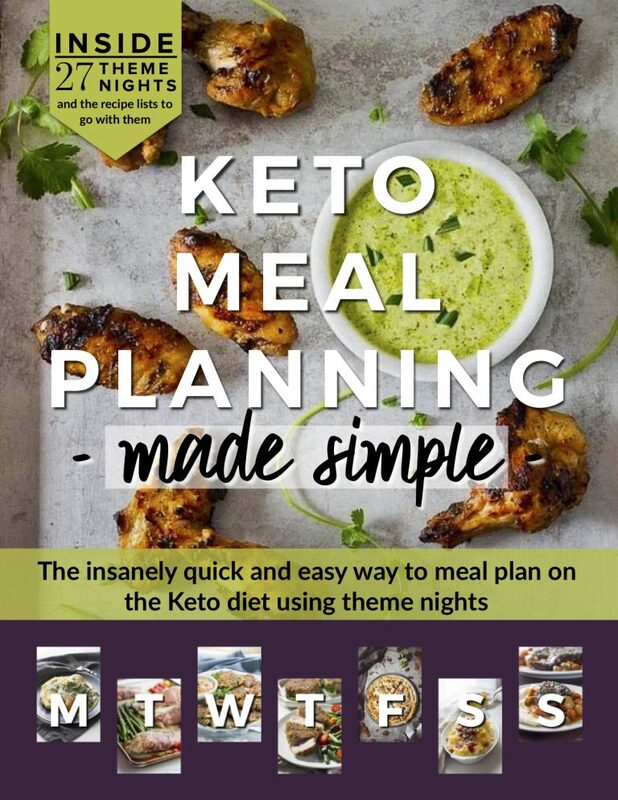 This will be in my recipe rotation for sure – thank you again for your wonderful recipes and website! This was the best salad I’ve had in a very long time! Husband requested again for the next nights dinner! Yum! Another winning recipe. This is perfect for summer. Everyone loved it. I made it according to directions, but added an additional tablespoon of lemon juice to thin the dressing a little. I also used grated cheese because that’s what I had on hand. Thank you! Is the serving size one cup? If I’m preparing this to serve the next day, is it ok to mix dressing with veggies or should I wait until next day? Looks delicious! The article doesn’t repeat Amish broccoli cauliflower salad enough, IMO. Such a delicious salad! Worth making! Thanks so much Anita for bringing this comment over from Facebook. I’m glad you liked the recipe. Enjoy your week! ?